Looking for a challenging hike, take a hike up thumb-butte. 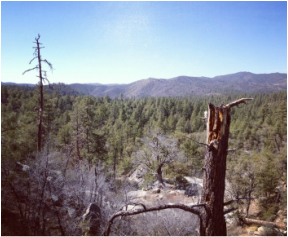 See Prescott from afar and get one of the most beautiful views of the forest that there is! Constellation Trails ^ is a mild hike, with many trails to control your distance, bike friendly as well. Close to Watson Lake and the Phippen museum. White Spar Camp-ground hiking trail ^ located 5 minuets from Apple Creek Cottages off of whitepar road.